The title is from the story of Jesus raising Lazarus from the dead in the fourth chapter of the Gospel of John. This chapter, as you probably know, also contains the shortest verse in the Bible, John 11:35 “Jesus wept.” After Lazarus was raised from the dead Jesus said, “Loose him, and let him go.” This man, who had been dead and in a sealed tomb for four days, was now alive! Not unlike Lazarus, I, too, was dead; I was spiritually dead. But Jesus came into my life as my Lord and Savior when I asked Him to and He raised me from the spirtually dead. Essentially, He cried out for me, “Loose him and let him go” as He did for Lazarus. But He raised me to eternal life! 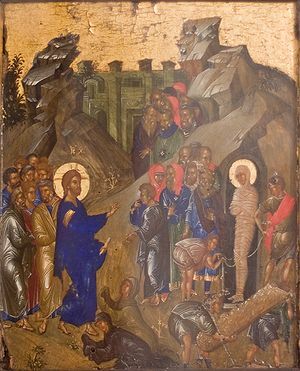 As the formally dead Lazarus was now a witness for the power of Jesus Christ, am I now, too. People are like dogs. Without a master, we cower in the shadows. We commit foul deeds in the dark. Some of us are lucky, and see HIM walk by. Some of us continue to hide in the weeds. Some of us cautiously watch. Some of us slink forward for a pat on the head, only to run away in fear and shame after a few seconds. After repeated appearances, some of us feel HIS love, some of us hear HIM calling. Some of us follow HIM home. He invites us in, but we just stay in the yard, or on the porch. There is food and water. We try to stay there, but we tear up the furniture. We go on the floor. We bark all night long. So we end up back outside. HE gives us chance after chance. Each time we get better. Each time we stay in HIS presence longer. We eventually get to sit on the couch with HIM. With HIS hand on us. Quietly, peacefully, in his care. I can’t recall if I’ve ever written about my calling to the ministry or not. I’ll have to look and either post where it is or about it; I think you’d enjoy that as well. I’m not ordained at this point so I’m not a “pastor”; preacher, teacher, yes, but no official titles/credentials at this point. We actually have just moved from our church of many years to a new one; a scary move totally taking God on faith it was time. I’ve preached, taught all levels of folks, guest spoken, Sunday school superintendent, and you church organizer/unofficial pastor. At our new “home” I’ll be working with teens again, a challenge I look forward to. Sounds like you’re following your destiny–fabulous!! I’m trying to be obedient. I fail at times, we all do, but thankfully His grace covers me then, too. It takes courage to move out in faith when He calls, but oh what a blessing.